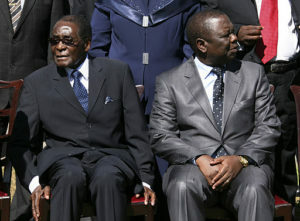 Morgan Tsvangirai (right) and his political nemesis Robert Mugabe. File photo. ZIMBABWE–As Zimbabwe comes to terms with the passing of one of the most iconic politicians on the continent Morgan Tsvangirai, the continent has also joined in the mourning of a man who came within a whisker of unseating Robert Mugabe, only to be outmanoeuvred and ultimately outlived by the nonagenarian politician. Tsvangirai, the leader of the opposition Movement for Democratic Change (MDC), died on Wednesday evening aged 65 after a long battle with cancer. And now, many analysts, social commentators and politicians have come up to lavish praise on the leader, whom they describe as a unifying factor in Zimbabwe, that was facing tough economic times during President Mugabe’s leadership. “He remained a national figure who obdurately insisted on free, fair, credible and non-violent elections as a way of strengthening our democracy,” said Zimbabwe’s President Emmerson Mnangagwa, who replaced Mugabe in November. During Mugabe’s rule, Tsvangirai suffered repeated abuse and harassment from Zimbabwe’s security forces, including a 2007 beating in police custody that left him with a badly swollen face and a deep gash on his head. Scores of his supporters were beaten and killed during campaigning for a 2008 election that eventually resulted in four-year unity government with Tsvangirai serving as prime minister in Mugabe’s government. Mr Farai Mbira, the leader of Zimbabweans United for Democracy (ZUNDE), said the country will miss Tsvangirai, who dedicated his life to the dismantling of Zanu PF dictatorship. “It is not disputable that Tsvangirai became the embodiment of our aspirations for freedom. It did not surprise me when even Chiwenga, a freedom fighter, had his senses back and acknowledged that Tsvangirai was a hero. Indeed Tsvangirai was unique; he fought for freedom and finished well,” Mr Mbira said. He urges the MDC to maintain Tsvangirai’s legacy by setting aside power differences and realise his dream. Tsvangirai, then secretary general of the Zimbabwe Congress of Trade Unions, founded the MDC and became its first leader in 1999. In 2000, the MDC rattled Mugabe’s Zanu-PF by coming within a few seats of beating it in parliamentary elections. After good performances in presidential elections in 2002 and parliamentary elections in 2005, the MDC beat Zanu-PF in the 2008 parliamentary elections and Tsvangirai won 47.8 per cent of the vote in the presidential poll, according to official results, placing him ahead of Mugabe, who received 43.2%. 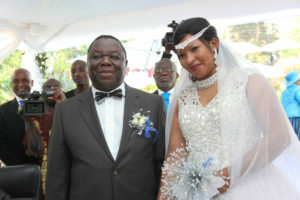 Morgan Tsvangirai and wife Elizabeth on their wedding day. File photo. Many observers believed Tsvangirai had in fact won outright. But because he did not get 50 per cent of the vote, a run-off election was called. Zanu-PF launched its militias in a campaign of violence against MDC supporters, forcing Tsvangirai to withdraw from the contest, leaving victory to Mugabe. But the regional Southern African Development Community, hitherto indulgent of Zanu-PF’s authoritarianism, was not convinced by Mugabe’s victory and was disturbed by images of political violence. With then South African President Thabo Mbeki as its special envoy, it persuaded Zanu-PF and the MDC to enter into a power-sharing unity government, with Mugabe remaining as president and Tsvangirai taking the new post of prime minister. Former senator and education minister David Coltart, a member of the other MDC faction, MDC-Ncube, said Tsvangirai’s greatest achievement had been to lead the campaign to change Zimbabwe’s constitution (to a more liberal one) in 2013. “That was his crowning achievement,” Coltart said. “Had it not been for his leadership and his determination, I think we would have been stuck with our old constitution. “And I think the other achievement is that he showed not just Zimbabweans but other Africans right across the continent that peaceful change is possible. Although he never acquired power, his assumption of power as prime minister in 2009 was the result of a determined, long struggle which was by and large peaceful. “His departure will no doubt cause major problems within his own party, the MDC-T, where there is a very fierce contestation taking place and one of his unfortunate legacies is that because of his charisma, because he was such an iconic figure, his party’s brand was largely centred on him as an individual. 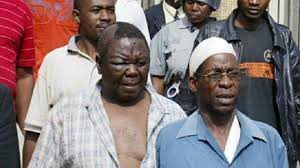 Morgan Tsvangirai (left), like many freedom fighter, sustained injuries in a struggle that lasted for decades. File photo. Coltart said Tsvangirai’s death meant that Zimbabwe’s new president, Emmerson Mnangagwa, was going to have a much easier ride in this year’s presidential elections. Tsvangirai’s career was not without controversy. Some in his own party accused him of an autocratic leadership style, particularly in 2005 when they said he overrode a party decision to participate in the 2005 Senate elections. Tsvangirai decided instead that the MDC should boycott the election. The dispute prompted Welshman Ncube to walk out with several MPs to form a new party, MDC-N.
Born March 10th, 1952, in Gutu, Masvingo province, Morgan Richard Tsvangirai rose from humble beginnings with only a high-school education, to become one of Zimbabwe’s most formidable political and influential figures, earning national, regional and international recognition and respect. The first of nine children from the union of Dzingirai-Chibwe Tsvangirai and Lydia Zvaipa, Tsvangirai’s rise to national prominence stems from his days as the secretary general of the Zimbabwe Congress of Trade Unions (ZCTU) in 1988, where he led national strikes for the betterment of the country’s workers. Vibrant and energetic, Tsvangirai, a former member of the ruling Zanu-PF party, became a force to reckon with when the ZCTU he led transitioned into a political party in 1999, with him as its founding president. For almost 20-years since its formation, Tsvangirai and his MDC party centered their message of change on President Robert Mugabe, who has since left office, ousted by the military, in November 2017. However, with Zanu-PF still in charge, now led by former Vice President Emmerson Mnangagwa, Tsvangirai pressed on with his message of change, promising his loyal supporters victory over Zanu-PF, despite his failing health. Now remarried to Elizabeth Macheka, Tsvangirai drew ridicule during his tenure as prime minister, after reports surfaced of his alleged womanizing, and recklessness. Among the most public was his short marriage to Lorcadia Karimatsenga, who he divorced a short time later. Despite his shortcomings as a politician and private citizen, Tsvangirai gained the respect of many in Zimbabwe and around the world, for his bravery as a political opponent to Mugabe and the ruling Zanu-PF party. Among the various recognitions Tsvangirai received were Nobel Peace Prize nominations in 2008 and 2009, honorary doctorate degrees and others. Tsvangirai’s decision to go public with his cancer diagnosis and his courageous fight against the cancer that ultimately deprived him of the opportunity to fulfil his dreams of a new Zimbabwe as its president, also gained him additional respect. He is survived by several children and his wife, Elizabeth.